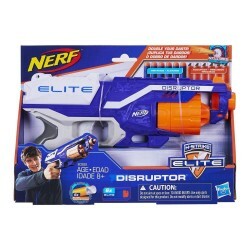 "Experience the excitement, energy, and attitude of the Nerf brand, and find out why It's Nerf or Nothin'. 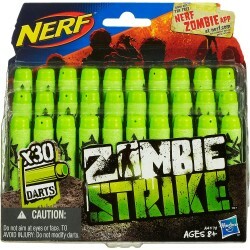 The Zombie Strike line brings you dart-firing blasters so you can defend yourself against a zombie invasion. No one knows exactly what happened the day the zombies struck, but you will be ready for them with the Zombie Strike blasters from the Nerf brand! 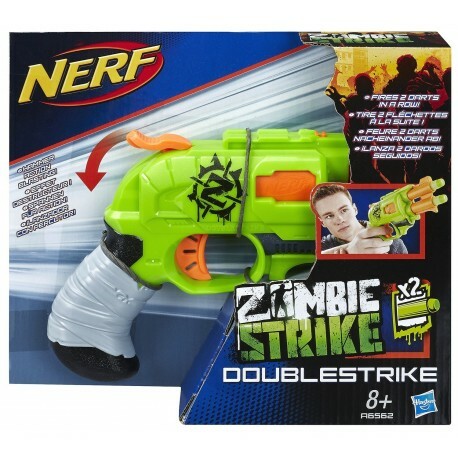 You never know when the zombies will strike, so stay prepared with the Zombie Strike DoubleStrike blaster from the Nerf brand. The DoubleStrike blaster fires 2 darts in a row with one-handed hammer action. The green blaster has vertically stacked twin barrels. Get ready for zombie action by loading 1 Zombie Strike dart into the front of each barrel. When it's time to make your move, pull the hammer back, then pull the trigger to fire 1 dart. Do it again for a double-tap defense! When you need to act quickly, bring along the Zombie Strike DoubleStrike blaster from the Nerf brand. 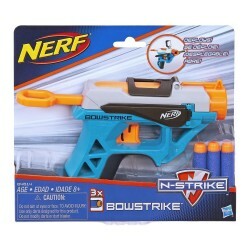 The green DoubleStrike blaster has one-handed firing for quick-draw action. With its compact size, you can take along this Zombie Strike blaster on missions when stealth and mobility are necessary to keep you one step ahead of roaming zombies. The green Nerf zombie blaster fires 2 darts in a row with hammer-action blasting so you're ready for any unexpected zombie encounters. Unleash double-dart firing power with the Nerf Zombie Strike DoubleStrike blaster. 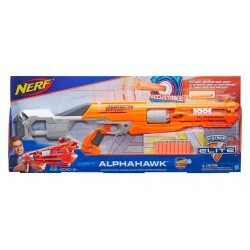 This front-load, double-barrel blaster features hammer action and fires 2 darts in a row for a double-tap defense. Be ready to defend yourself in a zombie invasion with the DoubleSrike blaster! 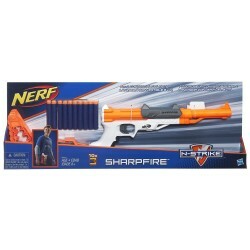 Includes: blaster and 2 Zombie Strike darts."